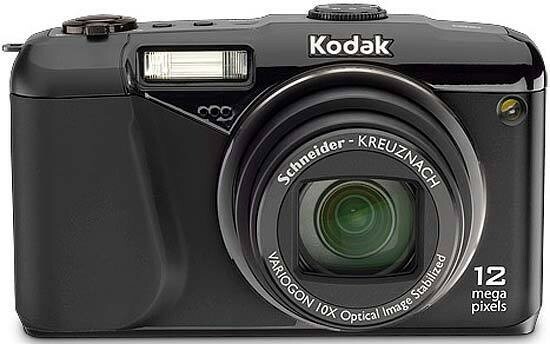 The Kodak EasyShare Z950 is the latest compact camera to feature a 10x zoom lens. Providing a focal range of 35-350mm, the Kodak Z950 makes up for its lack of wide-angle capability by offering a wealth of features for beginners and more experienced photographers alike. These include built-in optical image stabilization to reduce camera shake, fast maximum apertures of f/3.5 at 35mm and f/4.8 at 350mm, a large 3 inch LCD screen and 12 megapixel sensor. Kodak's Smart Capture feature automatically identifies the scene in front of you and adjusts camera settings accordingly, while program auto, aperture priority, shutter priority, and manual modes cater for the keen snapper. 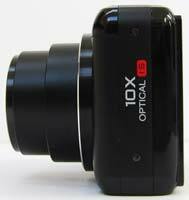 HD quality video at 30 fps with sound and on-camera editing completes the overall package. The Kodak EasyShare Z950 retails for £199 / $279 - Gavin Stoker finds out if it can challenge the likes of the Panasonic DMC-TZ7, Canon PowerShot SX200 IS and Samsung WB550. Despite a run of innovative digital imaging products in the late 90s and early Noughties, Kodak is undoubtedly not the first brand that springs to mind when looking to purchase your next digital camera. Aiming to hopefully change that is a newly released 10x image stabilised Schneider-Kreuznach Variogon optical zoom Z-series model in the Easyshare Z950. Pitched against the likes of the TZ series from Panasonic, thanks to a 35-350mm equivalent range in 35mm film terms, it's priced at what initially appears to be a very reasonable £199 in the UK. Especially so, as the metal and plastic mix build camera feels reassuringly rugged and chunky, the Kodak offering a still portable weight of 223g without battery or card. Comfortably tactile rubber padding at front and back - reminiscent of the keypad of an old ZX Spectrum PC - enables a good, firm grip when shooting handheld. One-handed operation is possible, though gripping in both feels altogether more secure - and preferable to help avoid camera shake when shooting at maximum telephoto. Encouragingly, with an all-black finish the camera suggests itself as one of Kodak's more serious propositions of late. It certainly doesn't look or feel like a budget model. That's not to suggest in any way that the Z950 isn't beginner friendly. The 12-megapixel compact incorporates Kodak's Smart Capture technology, a variation of intelligent auto that automatically recognises scenes and adjusts focus, flash, and exposure to achieve optimum results if simply pointing and shooting. In fact, Kodak is promoting this camera with the tagline 'shoot like a pro without knowing what an f stop is'. That sounds like an audacious claim given the entry-level pricing and that the rest of its spec list is merely what's nowadays expected; functions includes face detection, a 3-inch, 230k dot resolution LCD monitor in the absence of an optical viewfinder, selectable light sensitivity ranging from ISO100 through ISO3200 if you don't mind a resolution drop to 3.1 megapixels if accessing that highest setting, lithium ion battery, 32MB internal memory, plus SD or SDHC card compatibility. No removable is supplied out of the box however. We do however get MPEG-4 compression format high definition quality 1280x720 pixels video (not quite Full HD 1920x1080 pixels) at a very respectable frame rate of 30fps, offering up to a maximum 29 minutes per sequence, depending of course on available data storage capacity. Surprisingly for the Z950's price point and user-friendly features we also get multi pattern, centre weighted and spot metering, along with a full compliment of creative controls in program, aperture priority, shutter priority and manual. As expected, these are accessed via a top plate mode dial the size of a halfpenny or five cent piece. Partly recessed into the top plate, as, we guess, part of an attempt at minimalist design, there's just enough standing proud to turn it between finger and thumb. Also providing a degree of hands on control are five on-board colour modes: high colour, low colour, natural colour, black and white plus sepia. In review mode, images can be magnified up to 8x to check fidelity of detail; it's pretty much clear immediately which are suffering from camera shake. 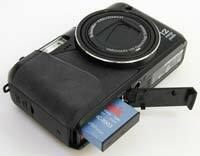 Unsurprisingly this Kodak camera also features a 'share' button to earmark individual images for instant printing via a PictBridge compatible device or email, when the camera is connected to your desktop via USB lead. While the above comprises the Z950's main features, let's take a tour of the camera to see how it measures up as regards control layout, intuitiveness, build, and real world handling and performance. Starting at the front - or business end - the faceplate, itself mixing rubber plastic and metal, is dominated by the large aforementioned zoom lens, stored almost flush to the body when not in use and extending by roughly an inch and a half when it is. Top right of this is a window for the AF assist and self-timer lamp, and to the left a rectangular window for the flash. In practice, as the flash is located so close to the grip, it's easy for the middle finger to accidentally 'wander' in front of both it and the microphone imbedded directly below. It's not the only such compromised offender however - and is preferable to fingers straying in front of the actual lens, as is a constant issue with Sony's T-series Cyber-shots. The top plate of the Kodak, typically for the family-friendly brand, features a well-spaced, clearly designated array of controls. At the far right, next to an eyelet for attaching the provided wrist strap is the shutter release button, encircled by a springy rocker switch for the zoom with large protruding lip that, like the button itself, easily catches the pad of your forefinger. It's similarly easy to determine the shutter release's halfway point, the Z950 emitting a 'dink' sound and the central AF area highlighting in green to confirm focus and exposure have been determined and the user can proceed to take the shot. Whilst this process isn't lightning fast, it's perfectly adequate for its mass user target audience - even if busy scenes, particularly in low light, can cause some confusion. However go on to take the picture and there's little in the way of shutter delay, the screen blanking out briefly and then displaying the captured image while it's being written - a process taking a slightly leisurely 3-4 seconds for a maximum resolution, least compression JPEG. To the left of the shutter release button, if looking down on the camera, is a trio of identically sized buttons - the first two calling up flash and self timer functions, the third being the power button. Press this and the camera readies itself for action in a very respectable time of just under two seconds, lens barrel extending to maximum wideangle setting and the clear rear LCD blinking into life. When the camera is active, the aforementioned flash and self timer symbols on the top plate are illuminated, as is the indicator next to the mode wheel - the next control we come to - and, rather more visibly, an HD symbol over to the far left. Taking pictures at night on London's sound bank therefore had me feeling slightly self-conscious and a possible target for muggers. Next along on the top plate is the main shooting mode dial, which, again is surprisingly feature-packed for an inexpensively priced model, with nine options to choose from. As well as full auto, users are rewarded with the creative quartet of program, aperture priority, shutter priority and manual modes. In any of these creative modes, the basic screen info is supplemented by an additional toolbar running across the bottom of the display. Via this, users can manually adjust ISO settings between 100-1600, swap between auto, manual, macro and infinity focus settings, tweak exposure, plus in manual mode itself, additionally shutter speed and aperture. Again, all this from a 12 megapixel, 10x optical zoom camera a penny shy of £200. You have to pinch yourself. Next to these is a camcorder-like icon for the Z950's video mode. As our sample HD video clips show, the Kodak has trouble in attempting to adjust focus for moving subjects - drifting drunkenly in and out - though maximum frame rate ensures a smooth replay and the MPEG4 compression format (as opposed to AVCHD) no compatibility issues. What's more, the full extent of the zoom can be accessed whilst recording - it doesn't merely freeze at the point it was set to before filming commenced. Apart from top 1280x720 pixels resolution, users can opt for 640x480 or 320x240 pixels depending on end usage. The last three modes on the dial are for sports, panorama, and scene. The latter presents 17 pre-optimised setting options, including the regulars of beach, snow, and fireworks alongside a les familiar option for photographing performers on stage - whereby flash is disabled and brightness levels boosted. As the user alights on each of these options with a nudge of the directional joystick that falls under the thumb on the camera back, a brief text bubble pops up with a two-line description as a form of on-screen user guide. Moving to the back of the camera then, this is inevitably dominated by the large LCD in the absence of any optical viewfinder. We've been spoilt recently by screens on compacts with the resolution more commonly fund on digital SLRs, and against these the visibility provided by the Z950's 230k dots is decidedly average - inevitably suffering in strong late summer sunlight. But then, what can you expect for a mere £199? To the right of the screen is a row of slender function keys running top to bottom, momentarily recalling the much-loathed 'piano' keys previous found on Samsung's NX series of compacts. Thankfully, Kodak's are marked with icons, though curiously, the dedicated button for deleting images more closely resembles an upright baby's bottle than the familiar trashcan icon - although the latter appears on screen when you press said control. A slightly odd bit of design there then. Next down we get what resembles a page of text that sure enough calls up the Z950's on-screen menu folders, which in their straightforward layout - albeit with nicely animated graphical headings - are at least immediately user friendly and so easily navigated. The third button down, marked with a lower-case 'i' is, naturally enough, one for 'info'. If shooting in auto mode, a press of this button merely turns off the basic information at the top of the screen - selected shooting and flash modes, resolution, number of shots remaining - to provide a 'clean' image. However, if shooting in the more hands-on creative modes, a further press will bring up a live histogram in addition to the rest of the on-screen info. Again, this camera costs just £199. The last of the four buttons to the right of the screen is for playback. While a press of this provides the option to review saved images, a press of the menu button in this mode brings up the usual range of options, plus Kodak's auto enhancing 'Perfect Touch' technology. Apply this to an image - which works most effectively in lifting detail from shadow areas and evening out exposure - and either the new image is saved alongside the original, or the latter can be overwritten. Neat. Staying on the camera back, right of the screen is a built in speaker, beneath which is the aforementioned four-way directional joystick for tabbing through and implementing settings - the latter requiring a firm, direct press, which can occasionally make for fiddly operation. Still, said joystick is reasonably large and ridged to avoid your thumb slipping and the camera scooting past the setting you actually required. Beneath this is the familiar - to the Kodak range - red 'share' button, a press of which earmarks images as favourites and works in tandem with EasyShare software supplied on CD ROM when the camera is attached to a PC via USB cable. Our natural instinct to avoid being molly-coddled means we tend to ignore this hand-holding option entirely and use a card reader instead, as truthfully, the quality of an image can't be accurately assessed via LCD screen alone. Speaking of which, are pictures from the Kodak Z950 really good enough to fool the user into thinking they've been shooting like a pro, or does the camera prove true to its price tag and deliver distinctly amateur offerings? We'll find out in a minute, but first there's the side mounted rubber flap covering power-in and AV/USB out ports to point out, plus the tripod screw thread at the base and sliding hard plastic cover ably protecting the lithium ion rechargeable battery and adjacent slot for removable media card. The EasyShare Z950 therefore comes across as all the camera you'd reasonably expect… and a little bit more.